- WCW Bash At The Beach '96 (July 7) = The Outsiders (Hall & Nash) & Hulk Hogan fought to a No-Contest with Lex Luger, Sting, & "Macho Man" Randy Savage. - WCW Hogg Wild '96 (August 10) = The Outsiders defeated Lex Luger & Sting. - WCW Fall Brawl '96 (September 15) = The nWo (the Outsiders, Hollywood Hogan, & the nWo Sting) defeated Lex Luger, Ric Flair, Arn Anderson, & Sting in a War Games Match. 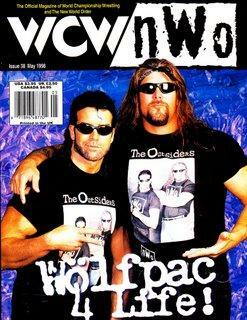 - WCW Halloween Havoc '96 (October 27) = The Outsiders won the WCW World Tag-Team Titles from Harlem Heat. - WCW World War III '96 (November 24) = The Outsiders remained the Tag Champs by winning a "Triangle Match" over the Nasty Boys and Meng and the Barbarian. Later in the night, the Outsiders competed in the "3 Ring Battle Royal", which was won by the Giant. 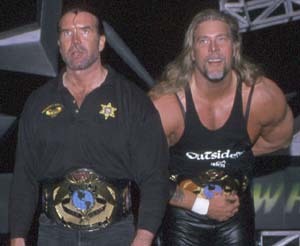 - WCW Starrcade '96 (December 29) = The Outsiders retained the WCW Tag Belts by defeating the Faces of Fear. 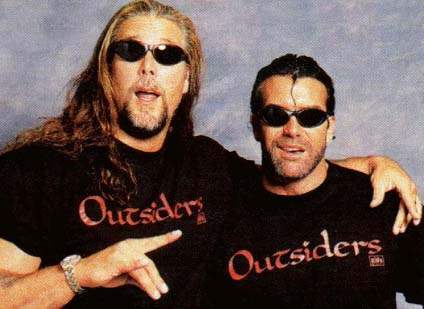 - WCW/nWo Souled Out '97 (January 25) = The Outsiders, as the WCW/nWo World Tag-Team Champions, lost to the Steiner Brothers (match later reversed by Eric Bischoff). - WCW Superbrawl VII (February 23, '97) = The Outsiders, as the WCW/nWo World Tag-Team Champions, lost to the Giant and Lex Luger (match later reversed by Eric Bischoff). - WCW Uncensored '97 (March 16) = Team nWo (the Outsiders, Hollywood Hogan, & Randy Savage) won a "Triangle Elimination" Match over Team WCW (Lex Luger, Scott Steiner, & the Giant) and Team Piper (Roddy Piper, Chris Benoit, Steve McMichael, & Jeff Jarrett). - NJPW Strong Style Evolution (May '97) = The nWo (the Outsiders & Masa Chono) defeated Keiji Mutoh & the Steiner Brothers. - WCW Slamboree '97 (May 18) = The nWo (the Outsiders & Syxx) lost to Roddy Piper, Ric Flair, & Kevin Greene. - WCW Great American Bash '97 (June 15) = The Outsiders defended their WCW Tag-Team Belts by beating Ric Flair & Roddy Piper. 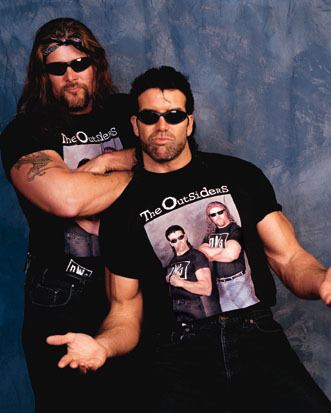 - WCW Road Wild '97 (August 9) = The Outsiders lost, via DQ, to the Steiner Brothers. The Outsiders retained the Tag belts. - WCW Boston Brawl (January '98) = The nWo (the Outsiders & "Macho Man" Randy Savage) were beaten by Lex Luger, Larry Zbyszko, & Diamond Dallas Page. - WCW Superbrawl VIII (February 22, '98) = The Outsiders won the WCW World Tag-Team Titles, beating the Steiner Brothers. - WCW Slamboree '98 (May 17) = The Outsiders lost the WCW Tag-Team Belts to the Giant & Sting when Hall betrayed Nash. - WCW Superbrawl IX (February 21, '99) = The Outsiders defeated Rey Mysterio Jr & Konnan in a "Mask" Match. Mysterio was forced to remove his mask. - Zero-One Hustle III (May 8, '04) = The Outsiders fell to Shinya Hashimoto & Naoya Ogawa. - NWA-TNA Turning Point (December 5, '04) = The Kings of Wrestling (the Outsiders & Jeff Jarrett) lost to Randy Savage, Jeff Hardy, & AJ Styles. - TNA Lockdown '10 (April 19) = The Band lost a "Falls Count Anywhere Steel Cage" Match to Team 3-D.
- TNA Sacrifice '10 (May 16) = The Band retained the TNA World Tag-Team Titles, beating Ink Inc (Shannon Moore & Jesse Neal).